Throughout history, man has been known for his brutality to man. It goes back hundreds of thousands of years, with our early ancestors' bones showing evidence of cannibalism. Indeed, the human race came close to extinction about 70,000 years ago during the Tuba supervolcanic eruption, which brought the entire human population to just under 10,000 individuals. After the Tuba eruption, the sky darkened, the earth cooled, and life became a struggle. The most combative, the most cooperative were those that survived. Fast forward to the present, and we are now living in a world with 7 billion interbred, cooperative and combative souls constantly struggling in a battle for dwindling resources. Those that cooperate in combat while wearing uniforms are celebrated as heroes by their respective combat clans, but those that do so in secret, often earn the scorn of all the clans. Today, Raw Story has a story about a group of nefarious hackers who last year targeted the media, and are now targeting a think tank seeking to shape economic policy. The article is not very clear on whether the group is backed by the Chinese military, but we are subconsciously made aware of the fact that these hackers are wearing hoodies while they go around hacking. Considering how politicized the hoodie has become in America, it behooves me to ponder how it is that in the past couple of weeks I have seen African-Americans wear hoodies with an-almost religious level of symbolism infused, and then to go on and see such a picture from a news organization that purports itself to be progressive. I'm only shocked to see Raw Story promoting anti-hoodie stereotypes, because even WND -- a highly religious, far right news organization -- had a story 6 days ago with the alarming headline: "Black man in hoodie banned from mall; handcuffed by police despite not committing crime." Just on the 17th of last month, Ann Coulter had this to say on WND, in her column headlined: "To avoid looking like a criminal, don't commit a crime." Coulter wrote: "Perhaps, someday, blacks will win the right to be treated like volitional human beings. But not yet." Clearly, Coulter is not sympathetic in words to her black viewers on Fox News, or in writing to all the black readers of WND, but even she did not dare insult the sanctity of the hoodie. In fact, she argued that it was ridiculous to assume that the hoodie was the cause of the whole Zimmerman affair in Florida. I can safely say that I no longer know what exactly to make of the hoodie, but I am wearing one as I type this because I'm sitting on the balcony of this very windy Dutch island. Does me wearing a hoodie make me a dangerous hacker, or a dangerous writer? Raw Story seems to think so. Someone needs to remind Raw Story of what our esteemed Representative Bobby Rush had to say on the subject of hoodies: "Just because somebody wears a hoodie, doesn't make them a hoodlum. The Bible teaches us, Mr. Speaker, in the Book of Micah 6:8: 'He has showed you, O man, what is good. And what does the Lord require of you? To act justly and to love mercy and to walk humbly with your God.' And in the New Testament, Luke 4:18 teaches us these words: 'The Spirit of the Lord is on me, because he has anointed me to preach good news to the poor. He has sent me to proclaim freedom for the prisoners and recovery of sight for the blind, to release the oppressed free. I urge all who hear these words to heed these lessons, may God bless Trayvon Martin and his..." as he was dragged out of the House of Representatives to: "The Chair will ask the Sergeant-at-Arms to enforce the prohibition on decor." The Chair then went on to remind everyone that hats were forbidden inside of the chamber, but a Sikh could not be forbidden from wearing a turban inside of the Chamber, so it goes to reason that Bobby Rush's religious freedom was directly assaulted. 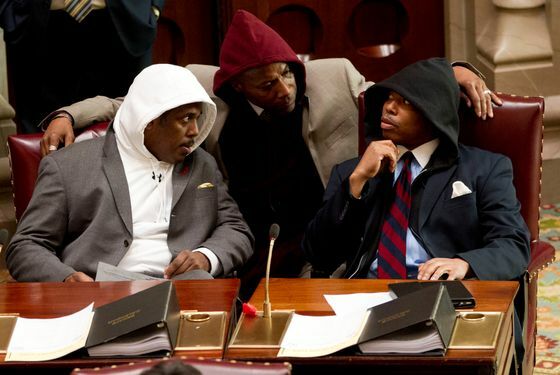 I for one am just glad that the New York Senate does not forbid the wearing of hoodies, and six hooded lawmakers went on to read the names of black men who had been martyred by New York police, but it was not clear if they were martyred for wearing hoodies. However, the very direct revelation is made that the names of the dead should be read while wearing a hoodie, and that hoodies can bring death.